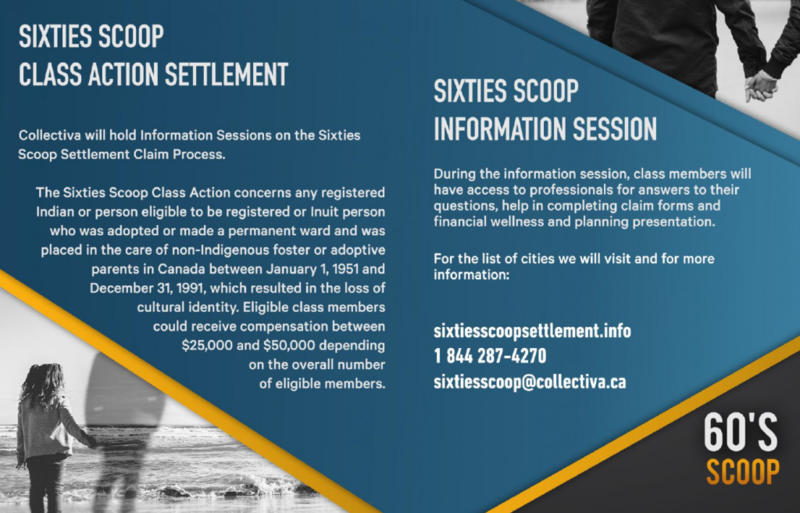 Collectiva will hold Information Sessions on the Sixties Scoop Settlement Claim Process. The Sixties Scoop Class Action concerns any registered Indian or person eligible to be registered or Inuit person who was adopted or made a permanent ward and was placed in the care of non-Indigenous foster or adoptive parents in Canada between January 1, 1951 and December 31, 1991, which resulted in the loss of cultural identity. Eligible class members could receive compensation between $25,000 and $50,000 depending on the overall number of eligible members. During the information session, class members will have access to professionals for answers to their questions, help in completing claim forms and financial wellness and planning presentation.